These girls are definitely slaying the makeup game! Makeup isn't always an easy feat. No textbook or manual can ever help you achieve that perfect chiselled-contoured look, or even help you perfect your first smoky eye. It all comes down to experience and countless of trials and errors. But with the power of social media platforms, you can now easily access thousands of tutorial videos and instantly ask for tips from makeup pros with only a click of a button. 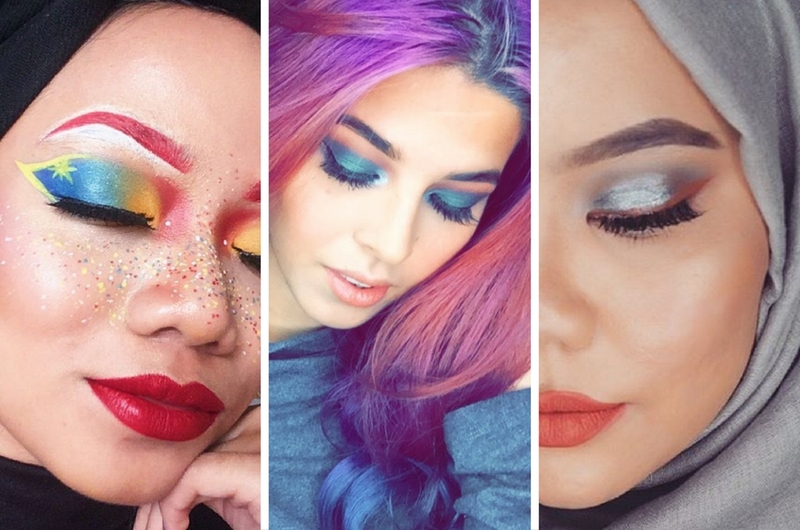 If you’ve just recently acquired some interest in beauty and makeup and don’t know where to start, here are a few Malaysian makeup experts you might want to follow. Mina Rosli is basically the chameleon of our dreams. If you’ve been following her for quite some time, you’d know she has a penchant for dyeing her hair in unique shades very frequently. We’re basically green with envy with her ability to pull off every hair colour she rocks! When she’s not busy filming tutorials on her Youtube channel, you can find her travelling around the world or hanging out with her friends or beautiful cat. Jenn is clearly on her way to dominate the world with her impressive resume! Not only is she a hilariously funny person, she’s also very talented when it comes to singing and hosting. This petite lady fills up her Instagram account with her daily adventures, random singing and of course, funny videos of herself. She also posts a few makeup tutorials and tales of her beauty hauls on her Youtube channel. This self-taught makeup artist is no stranger in the beauty scene. If you’ve been wondering why she looks so familiar, it’s probably because her magic hands and services are often enlisted to help doll up numerous Malaysian celebrities especially Yuna. If you’d like to take a peek at her work and some exclusive shots of your favourite celebrity, go follow her now! This hijabista and makeup aficionado is really slaying the makeup game! One look at her Instagram account and you’ll completely fall in love with her. She’s pretty much active on Instagram and frequently posts makeup tutorials, beauty reviews, and makeup swatches. Honestly, we’re pretty obsessed with all the eye looks that she has created. Alia is not only a passionate makeup enthusiast, she’s also a young entrepreneur! For those who don’t know, she’s the lady boss of the local lipstick brand, Ruby & Roses. Beware girls, Titi Athirah’s makeup skills are bound to leave you speechless! This oil & gas management student is also the founder of Boss Babe Makeup, which offers make up services not only in Malaysia, but also in Brunei and Singapore. Her Instagram feed is an absolute candy to the eyes, and not only does she frequently share her make up looks, she also shares her #OOTDs and talent for interior designing. Age is clearly just a number for this 21-year-old design student. Haneesa’s creativity not only flows on canvas but also her face. Take a glance at her Instagram channel and you’ll be transported to another whimsical world of makeup art. Due to her background in arts, not only does she slay your normal, daily-routine makeup but also slays when it comes to face painting and cosplay looks. Did we mention she does a bit of singing too? Really impressive, huh? Do you have a local beauty guru you look up to? Share their Instagrams with us in the comment section below.